home in Ashurst in Sussex on the train after a West End triumph, reading the theatre reviews. The train began life in June 1934 and most of the brown and cream Pullman carriages – the only electric Pullman carriages in the world – survived the war, holed up in the Crystal Palace High Level Station, now a housing estate. The Brighton Belle only took an hour to go the 51 miles from Victoria to Brighton, and it left every day at noon, pulling into the seaside at one o’clock on the dot. 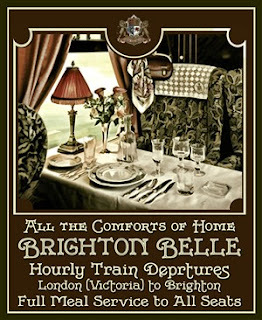 Along with the Golden Arrow boat train to Paris, it was the jewel in the crown of the old Southern Railways. It lasted until the 1970s. Southern’s successors have clearly not managed to keep up the reputation for luxury. It is worth remembering the great days of Southern rail because, although it is a different shape to the GTR franchise now – which covers the Great Northern franchise as well, and rather bizarrely has a registered office in Newcastle – it is not entirely dissimilar. One difference is that the old Southern Railways used to go as far as Cornwall, operating out of the biggest and most complex of all the London railway terminals, at Waterloo. But it also had a reputation for extreme efficiency, which none of the other Big Four railway companies, operating from 1923 to 1948, managed to attain – then or now. That efficiency appears to have been disposed of quietly, along with the reputation, and the luxury of the Brighton Belle replaced with the kind of functional Gatwick Express coaches without legroom or anywhere to put hot drinks – and which appear to have been designed so they can be hosed down easily. It marks the end of the achievement of the great railway manager, Sir Herbert Walker, and the journalist J. B. Elliot who took over from him and who masterminded Southern’s distinctive advertising (the little boy looking up at the train driver in his cab is still with us). It was Walker who managed to forge all the companies that made up the old Southern into one unit, symbolised by smashing a hole between the two parallel stations at Victoria. More on this in my short book about the Southern crisis Cancelled! I’ve written this blog because, now that we approach the train drivers’ strike, I’ve been thinking about Laurence Olivier, but also the French novelist Emile Zola, whose Dreyfusard open letter J’accuse in 1898 forced him into exile in Crystal Palace. It isn’t my intention to be forced into exile, though living in the Southern Rail franchise at the moment does feel a little like that. But equally, after finding it extremely hard to do my job – and therefore earn money (I employ myself) – I feel like making my own version of J’accuse about the ridiculous situation at Govia Thameslink and the Southern franchise. So these are the guilty individuals. They don’t include GTR CEO Charles Horton nor rail minister Paul Maynard. Neither have any real room for manoeuvre: they are ciphers, unable to prevent the closedown of train services to Sussex, even if they were willing to. Though they are complicit. But I should certainly include RMT leader Mick Cash and Aslef leader Mick Whelan for their lack of concern for the people who depend on their members, for their violent rhetoric (kicking in the teeth and all that). And for letting Southern off the hook for the consequences of their understaffing – allowing the government to shift to their favourite strike rhetoric. And Peter Wilkinson at the Department of Transport, responsible for the useless GTR franchise contract. It expect it will infuriate them to see themselves and their great enemies grouped into the same paragraph, but I don’t have the power to do more than annoy, ever so mildly. And note, the semi-retired and the managers are able to choose to stay at home to avoid the uncertainty and the disruption. Those who are suffering are the low-paid who have to commute, who work in retailing or those going to job interviews – and who appear to be having job offers withdrawn when managers discover they are relying on GTR. I have huge respect for the ordinary frontline staff on Southern, who put themselves on the line over and over again since the spring to support embattled passengers. But their union leaders and the GTR managers and the politicians hate each other so much, and are so obsessed with each other, that they don’t notice the human consequences of the current unravelling. 1. Chris Grayling, the Transport Secretary, who does so little to support beleaguered passengers, and is ultimately responsible for the dysfunctional contract which has caused all the trouble. 2. Andrew Allner, the rather shadowy chairman of the Go-Ahead Group which owns 60 per cent of GTR and who is ultimately responsible for their failure to recruit the staff they need – and for cutting anyone else on the platforms not actually screwed down. Both have other pressures on them, Grayling from the Treasury and Allner from the stock market – big fleas have bigger fleas upon their backs to bite them – but they are the people who are taking, and have taken, the decisions which led to where we are. Grayling’s proposal to hand over control of the track and infrastructure to the franchise holders is a very small step in the right direction. The idea of separating them was enforced by the European Commission on the Major government and certainly did not constrain Sir Herbert Walker. But what else are Grayling or Allner doing? Grayling appears to be relishing the situation now that it has come down to a strike, but what about us? Where are the chartered buses? Where are the chartered late night taxis? Where are the signs that the government has any concern about the impact on the Sussex economy, on its polluted atmosphere from the resulting traffic, on its wrecked lives? All we get are more security guards. And, please, there is nothing about the government’s vision of a human-free railway that is in any sense modernising. The industrial action has now begun, and will cause even more disruption until Christmas - and there is no reason to believe the chaos won't go on afterwards. So why is nobody responsible resigning?